I do more knitting than crochet, but here are a few projects I've developed over the years. Contributions welcome. 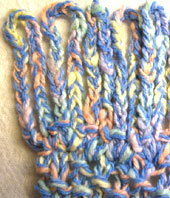 This fringe uses only chain stitch and slip stitch. Good for rugs and mats.